Today, I finally did something I have been planning to do for a couple of years. 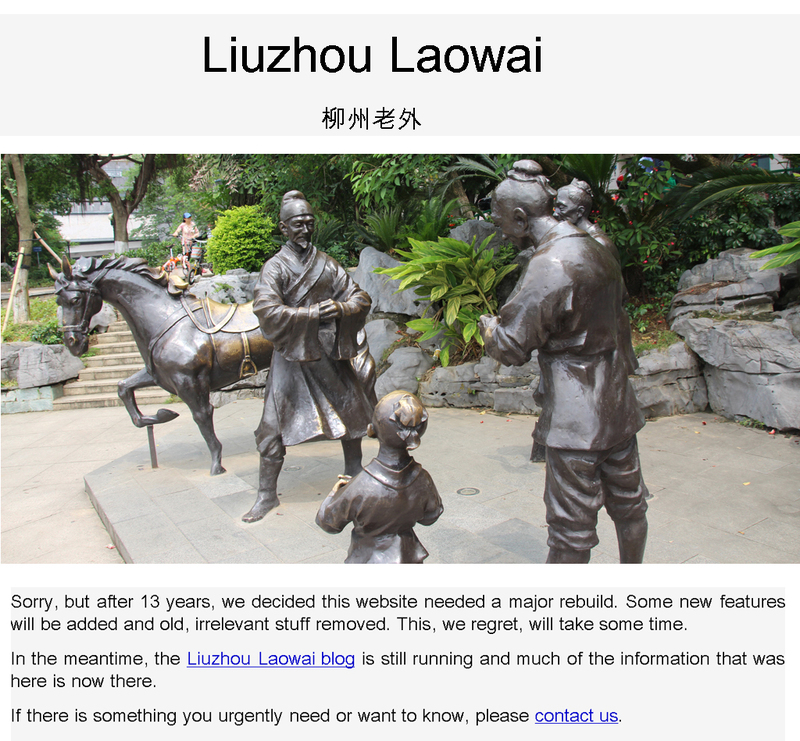 I deleted all the Liuzhou Laowai website apart from the blog and a couple of small side routes. Should you try to access any page on www.liuzhou.co.uk (other than /wordpress) you should see something like this. I have also deleted thousands of images – of course I made back-ups first. For all practical purposes, only the contact page should be functional. a) There was nothing on the internet about Liuzhou in English. b) I wanted to learn how to build a website. Today, the site was looking very tired and amateurish – no surprise there – it was built by an amateur. A lot of the information was also out of date. And the whole caboodle was bloated and hard to manage. It is important to me that the site carries information useful to anyone intending coming here – either for a week or to stay a while, but also useful to those already here. Anyway, I hope to complete the bulk of the work by September, but it is, in a sense, an unending task.
. This entry was posted on Monday, July 17th, 2017 at 6:30 pm	and is filed under About Liuzhou, Computer Stuff, Internet Stuff, Liuzhou Life. You can follow any responses to this entry through the RSS 2.0 feed. Both comments and pings are currently closed. I didn’t expect to find anything in English either. Many thanks for your pages, keeps me in touch until I return. I have a question. Are we only allowed to comment once on the site? I submitted a comment once and although I realize that you scan them for spam, every comment I have submitted since is refused because it says I already said that. If that is so, I will forget about the site. None of your comments has been refused by me and you can post as many as you wish. I have approved four comments from you today, but I cannot be on the computer all the time waiting for comments. They are usually checked once a day and I very seldom reject any comments (except spam although most of that is rejected automatically), even if I disagree with what someone says. At the moment I am not at home, so comments may take a little longer than usual to process. Of course, it could be that you are repeating a comment, before I have had time to look at and approve the first. That won’t work but will be rejected by the system. Nearly all blogs or other sites which allow comments work in the same way. If you have a more specific or unusual problem please feel free to contact me privately via the contact link at the top of every page. But don’t expect me to reply immediately. I do have a life outside this blog and have to work sometimes, sad though that may be.